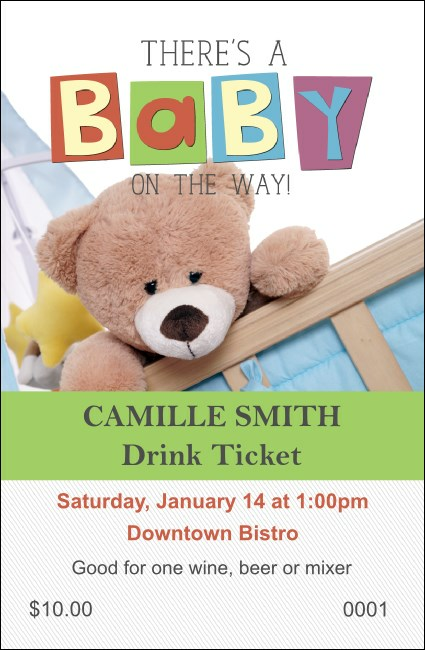 Salute the new parents with this Baby Shower Teddy Drink Ticket. Mixed pastels in green, red, blue, yellow and purple are perfect for the occasion as a crib-bound teddy bear with thoughtful eyes looks on. Toast their good fortune and keep the proceedings sunny by helping your guests get all the info they need on seven easily customized lines. Find the right ticket for your happiest occasions at TicketRiver.com.au!